Passionfruit is well known as not only delicious fruit but also nutritious resources such as iron, potassium, fiber, and carbohydrates. Homemade Yogurt is made from the fresh milk produced at one of the best dairy farms in Da Lat, which was proved through our famous cheese for years. Now you could enjoy both of fresh silky flavor of milk and naturally sweet taste of passion fruit in one delicious and healthy Homemade Yogurt jar. Their homemade yogurt is made from the same milk with two kinds of lactic acid bacteria (thermophillus and bulgaricus). It's fresh, mild, and milky. Try one without adding sugar and you can taste the real difference from other industrial yogurts. Yogurt is considered one of the top healthy foods. It's a great source of protein and calcium and is relatively low in calories. There's some evidence that if you consume yogurt on a regular basis, it helps you boost your immune system. 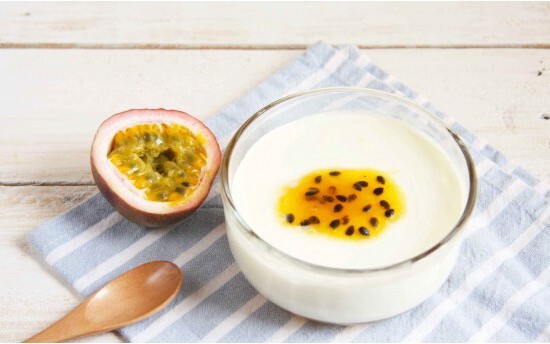 For eating plain yogurt without sugar by more exciting taste, we added passionfruit sauce that comes from high-quality fruits grown in exported standards. It's a nice and healthy snack for both kids and adults. Expiration period: 8 days after production date. Please consume it as soon as possible.